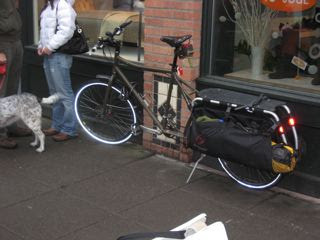 Here's a little Copenhagenize.com reportage from one of our readers, Koll. 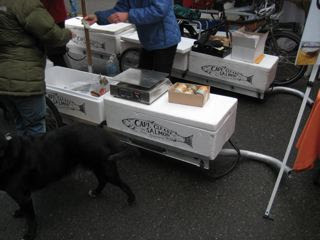 "These folks catch the fish out off the of the peninsula of Washington State (Port Townsend), then ride the ferry boat across to Seattle and tow their catch to the farmer's market in Ballard (Seattle's most Scandinavian neighborhood and home to many original immigrants and fisher-people) by bike every Sunday, that's a good 5 mile [8 km] ride after getting off the ferry, and the whole shebang is about 30 feet [10 m.] long! The trailers hold 3 coolers each, and are made from aluminum ladders with wheel assemblies and a unique hitch that that connects to each of their Surly Big Dummies (Xtra Bikes with extended wheelbases, made by the owner, Rick). Anyway, an awfully cool setup (and wonderful fish!) 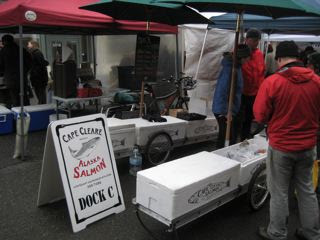 Here is their website (which is all about fish, not bikes, but there you go)." The Ballard Market is darn fun, with lots of carts, bikes, and just folks rolling in. Not Copenhagen, or even Portland, but pretty cool all the same." Now how on earth would we ever have heard this splendid tale if one of our readers didn't take the time to photograph and send a description?! Thanks so much, Koll.